Manandi Dagoino checks a young patient. Since we last wrote, Manandi and Chelsea have joined the Kunai Health Centre team. They have oriented well in the work, and along with the rest of our national staff (Jon Mark, Ellie, Jasper, Linda, and Jessica) they are ministering to our people in a Gospel-centered way. how to administer medicine to her child. · This year Kotidanga Baptist Church voted Ben Samauyo as their pastor, and he was ordained in June. Many were saved this year, and we have seen many others grow in their walk with the Lord! · Our radio station, Gutnius (Good News) Radio, went on the air in October with the help of Michael Wakefield from Christian Radio Missionary Fellowship. This has been a long-time project with many man-hours of back-breaking labor by our people to put the tower up on top of the mountain, and a lot of “brain work” to figure out the logistical and transmitter issues. · The Kamea Bible Project made good advances this year. We now have several books of the New Testament completed and ready for checking. I so appreciate my coworkers on the project, Pastor Ben and Yali. Yali works on the back translation of the Gospel of Matthew. · God has given us a great team of fellow workers. Sam & Marybeth Snyder and their children joined us earlier this year, and along with Sarah Glover and our nurses who were with us in 2017 (Tiffany, Erika, and Chelsea), they have served our people well and made a real difference in the lives of many. 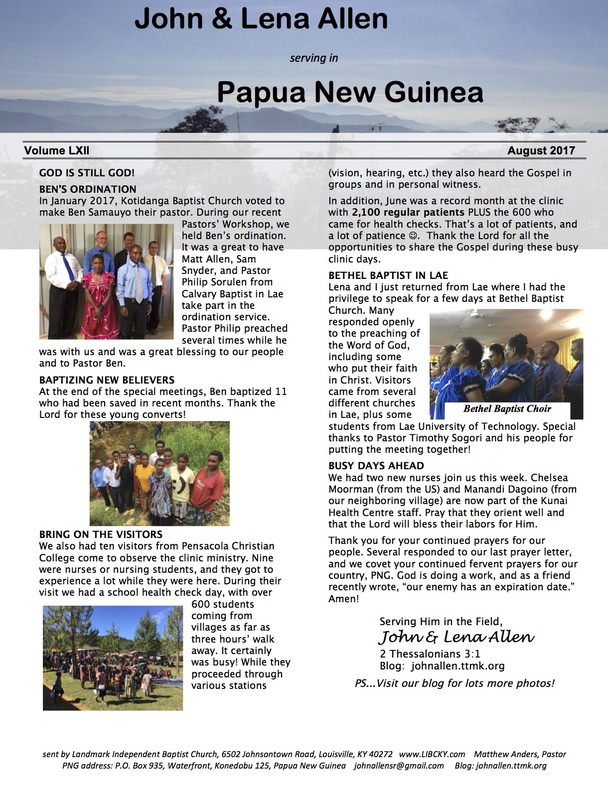 Daniel’s newsletter to get a visitor’s perspective of the ministries at Kotidanga). I made a quick trip back to the US in October to be in the Pensacola Christian College Missions Conference. It was great to be among so many servants of our great God and to be able to talk to so many young people about serving the Lord in missions. for the four years of service they gave to our people in Kotidanga! After my trip to PCC, I returned to PNG where Lena and I wrapped things up to head back to the US for our furlough. We arrive in the US just before Christmas, and we hit the road the first week of January. We covet your prayers as we travel, and even more, we long to have many wonderful Gospel conversations with believers and non-believers. Pray that we can be a blessing and that the Lord will be magnified. We will be in Kentucky, Indiana, North Carolina, Georgia, Maryland, Florida, Texas, Michigan, and Virginia…probably not in that order. 🙂 We plan to be back in PNG in April 2018. Also, we just celebrated another milestone: Lena and I have been married 40 years! Woohoo! Glory! We thank the Lord for your faithful love and prayers. The Lord continues to supply our needs, and we thank Him for using you all to do it. May you have a blessed Christmas, and may the Lord put His touch on your labors for Him in the coming year! PS: Enjoy the photos! And click here to watch our latest video from the field! Or click here to see the latest video with info about the clinic! Lena & Anjuta teach the Saturday Ladies’ Meeting. to say “thank you” with two fresh pineapples! It’s a busy clinic day as Pastor Ben shares the Gospel. No matter how busy the day is, Manandi always finds time to enjoy her patients. Sometimes the children come to the clinic just to hang out. Pastor Tau Abary and his wife, Suzanne…long-time friends of ours in PNG! Hello from Kotidanga Baptist Church in Gulf Province, Papua New Guinea! We had a packed house at Kotidanga Baptist for Pastor Ben’s ordination. In January 2017, Kotidanga Baptist Church voted to make Ben Samauyo their pastor. During our recent Pastors’ Workshop, we held Ben’s ordination. Ben presents his doctrinal statement before his ordination. It was a great to have Pastor Philip Sorulen from Calvary Baptist in Lae, Matt Allen from Port Moresby, and my co-worker Sam Snyder take part in the ordination service. Pastor Philip preached several times while he was with us, and he was a great blessing to our people and to Pastor Ben. At the end of the special meetings, Ben baptized 11 who had been saved in recent months. Thank the Lord for these young converts! Jon Mark, one of our most faithful church members, is blind. He works at Kunai Health Centre and he doesn’t let much slow him down! He was one of those who followed the Lord in believer’s baptism in June. We also had ten visitors from Pensacola Christian College who came to observe the clinic ministry. Nine were nurses or nursing students, and they got to experience a lot while they were here. PCC visitors pose with the staff of Kunai Health Centre. During their visit we had a school health check day, with over 600 students coming from villages as far as three hours’ walk away. It certainly was busy! While they proceeded through various stations (vision, hearing, etc.) they also heard the Gospel in groups and in personal witness. In addition, June was a record month at the clinic with 2,100 regular patients PLUS the 600 who came for health checks. That’s a lot of patients, and a lot of patience 🙂 Thank the Lord for all the opportunities we had to share the Gospel during those busy clinic days. Lena and I recently returned from Lae where I had the privilege to speak for a few days at Bethel Baptist Church. Many responded openly to the preaching of the Word of God, including some who put their faith in Christ. Visitors came from several different churches around the city, including some students from Lae University of Technology. Special thanks to Pastor Timothy Sogori, his wife Ruth, and his people for putting the meeting together! We had two new nurses join us this week. Chelsea Moorman (from the US) and Manandi Dagoino (from our neighboring village) are now part of the Kunai Health Centre staff. Pray that they orient well and that the Lord will bless their labors for Him. Thank you for your continued prayers for our people. Several responded to our last post, and we covet your continued fervent prayers for our country, Papua New Guinea. God is still God, and as a friend wrote recently, “our enemy has an expiration date.” Amen! Ben & Anjuta flew out with us to attend a pastors’ conference. Many patients are still captivated watching the “Jesus Film” whether in Pidgin or in Kamea. Ben came to the clinic and shared the Gospel with this young church member whose life was ending. The young man affirmed his faith in Christ alone, and in a short time he passed into eternity. Are you ready if your time were to come today? A GREAT DOOR AND EFFECTUAL IS OPENED . . .
We seldom mention in our prayer letters about the kinds of opposition we encounter here in PNG. All those who serve the Lord Jesus soon enough find opposition to the advance of the Gospel, and here it is no different. What is different for us is the type of opposition. Papua New Guinea is one of the last frontiers in the world. In the scope of world history, and even though PNG has its own rich history through its over 800 different tribes, there has been little influence from the outside world until the last 150 years, and even today, there are many PNG people who have no clear idea what the western world is like. Many areas of PNG have been strongholds of Satan for millennia. Unhindered by the Gospel, the adversary has had free reign among these precious people groups. With the arrival of the Gospel in the last century, varied forms of opposition have arisen and continue to this day. I wanted to share just one of them, in order that you could join us in praying against the hindrances to Gospel advance here in PNG. Our Kamea people have their own cultural practices and beliefs, yet many of these are related to evil spirits; either appeasing the spirits, or controlling the spirits. This is a hidden practice, and it took years to learn how wide spread it is even among professing Christians. Further, at the present time there is a group here who are calling for a reviving of their culture and a forsaking of Christian ideals in order to return to the “old ways.” (Interestingly, they still want to use modern clothes, solar power, transportation, etc., so I guess the “old ways” weren’t all that good…) Some are taking portions of Scripture and re-interpreting them as being directly about our people. Places and events in the Bible are being “discovered” here in our region, and thus they say that the stories of the Bible are really about the Kamea people. Promises of blessing to Israel in the Old Testament are being claimed for our people. Another group took a King James Bible (a give-away copy) and built a sacred house for it, saying, “now that the Bible has come back to where it started from, the blessings of God will be poured out on us.” Such things are not unique to our place; these things are believed all over PNG, with each group putting its own twist on the stories. Naturally, our preaching is not popular, because we insist that the Word does not teach that this place where we live is Israel, nor does it teach a mixture of ancestor worship and worship of the Lord. That our believers would walk humbly with God, trusting Him rather than the spirits? That they would believe God in spite of incredible pressures from their unbelieving family and friends? That Jesus Christ would be exalted among our dear Kamea people? That the power of the Gospel would break the chains of sin and Satan here? May God strengthen you as you join with us in prayer on behalf of our people! For over a year, Lena and Anjuta have been meeting with our church ladies on Saturday afternoons. They bring lost friends for the three consecutive teaching sessions (What is the Gospel, How to Mature Spiritually, and Principles of a Christian Family). The number of ladies continues to grow, and the ladies themselves are growing in grace. God is using the preaching at church, personal discipleship, and this ladies’ meeting to mature them to His glory. They have tea, sweet baked goods, and honest fellowship around the Word. Women are neglected in this society in the jungle, and this is a special time just for them. Husbands have commented to me about the good changes they have seen in their wives since they have been attending the ladies’ meeting. Amen! I get the opportunity to meet with our single young men on Fridays to share in their struggles, pray, and to seek biblical answers for the issues they face. They too are maturing and growing. God is doing a work in their midst! Kotidanga Baptist Church voted unanimously for my co-worker, Benjamin Samauyo, to become their pastor. Ben has done the work of a pastor in their midst for over two years, and the church was quite vocal that they wanted Ben because he and his family exemplify the qualifications of a pastor in 1 Timothy 3 and Titus 1. We plan to ordain Ben the first week of June. These are exciting days! Thank you for the part you have in enabling us to minister here. May God bless you abundantly for your sacrifice! Our home church’s Christian school ministry put together children’s vitamins for us, and they finally arrived! First time we ever had medicine and supplies delivered to our front door. We could get used to this! Tiffany Heafner’s mom Linda and brother Niko came to visit. Her mom is a nurse too, and we put her right to work! We had two emergencies one night while Tiffany’s family was there. We sure were glad for the extra hands! We had to shorten up a chain on the sawmill. The factory said we couldn’t do it with just a file. Haha! The factory has never seen a determined Kamea man before. He did it! Then tie the 25 ft log to your little truck, and drag it 3 miles to the bridge. Tear up the bad parts of the bridge, put in the new logs, and you’re done! Flights around our place certainly reveal the majesty and handiwork of our great God. We thank the Lord for His provision each year for baby milk for our clinic ministry. 2016 was the first year that income exceeded expenses…amen! The dedicated staff of Kunai Health Centre continues to provide service to infants and small children in need of nutritional supplements. In some cases, the mother has died in childbirth, or shortly thereafter. In other cases, the parents have given the child away as they are unable to feed another mouth…and yet others of our “baby milk babies” have mothers who are unable to produce sufficient milk to feed them. The program began in 2009, and it has served over 250 children since then. Some of these children are school age now, and seem to be doing quite well. Thank you to everyone who joins with us in prayer and financial support of this vital program. Our children thank you too! Since our last newsletter, we held our semi-annual Pastors’ School. This time we opened it up to many in our local church who are growing in the Lord, and it was a huge success. Missionary Sam Snyder and his wife Mary Beth helped Lena and me with the teaching, and our people were blessed from the time in the Word. Ben, Yali, and I were pleasantly surprised when we totaled up the chapters completed thus far on the Kamea New Testament. We have finished a rough draft of one-third of the project! Then, just a few days ago, we finished the back translation of the book of Acts. There remains some checking to do on what we have done, but we rejoice that God has blessed this work in the way that He has. We have big plans for 2017, so pray with us for God’s wisdom, direction, and strength as we move forward in the months ahead. Kunai Health Centre was blessed by the recent visits of two medical professionals. Becky Pope, RN, works with Medical Missions Outreach, and she was an encouragement and blessing to our staff. We also enjoyed a visit from Dr. Beth Lewis, a fellow missionary who works full-time at Kikori Hospital here in our own Gulf Province. Dr. Beth’s enthusiasm and experience in PNG medical issues taught our staff much about doing medical work out here in the bush. Thank the Lord for those gifted in medicine who give their lives to serve the Lord! Late afternoon is quiet after Kunai Health Centre closes for the day. In our last letter we mentioned about our young people being blessed at a conference they visited in September. One of those same youth was saved here the last Sunday of 2016, and then another trusted Christ the first Sunday of 2017. God is still working in their hearts! Speaking of youth camp, in December the Lord allowed Lena and me to fly out to Port Moresby to be with Matt, Becky and their girls during their first youth camp at Capital City Baptist Church. Our son Nate was the guest speaker, and we all had an awesome time! 16 youth were saved, and all of us were blessed by the sound biblical preaching and teaching. Even the youngest boys at Kotidanga Baptist Church take part in Scripture memorization! Your faithful prayers and support have enabled us to continue as your co-laborers here in PNG. Please accept our heartfelt “thank you” to those of you who stand with us! Some days you wonder if there is a more beautiful place here on earth! Christmas dinner with the team! Lena, visitors Brent & Brian Doss, plus our own Sarah Glover, Erika Sharpeta, and Tiffany Hefner. Brian & Brent Doss found out the bush missions means a lot of maintenance. Here they help our church crew (in the background) repair a landslide that bit out a large chunk of the “road” to the airstrip. Ben built a new kitchen for his house. Here are the roofers tying on the bamboo leaf roof. Dr. Beth was here for such a time as this! This young boy fell out of a tree and broke his arm in several places, plus dislocating his elbow. After using the ultrasound to ascertain the break points, Dr. Beth worked with the nurses to reset the arm. Amazingly they got it straightened out, casted him, and sent him on to the regional hospital in Kerema for follow-up. Recently fourteen of our youth attended a conference at Wau Baptist Church, a four-day hike from here. Even with the hardships they encountered in travel, they returned full of joy, and it is evident that the Lord did a work among them. Our youth here have the same struggles as youth do anywhere; please pray for these first-generation believers that God will use their lives to impact their people with lives lived for His glory and the gospel! Each Saturday, Lena has had the privilege of working with Ben’s wife, Anjuta, in teaching the ladies of Kotidanga Baptist Church about godly Christian living. Here is a picture of them singing as a group in our worship service. From ages 14 to 60, these ladies are trophies of grace! Among the benefits of working here are the opportunities we get to speak publicly. Preaching in the open air market is done every week, and dozens of people listen attentively. Recently our member of parliament came for a visit to our electorate, and I was tasked with speaking on the current healthcare situation in our area. We have lived here almost nine years and are well known among our people; and God’s testimony among the Kamea continues to grow. Thank you for your prayers and assistance in continuing here in PNG serving the Lord. As we celebrate our 39th wedding anniversary this month, I am joyfully amazed at how much the Lord keeps growing the two of us. Do remember us and our people in prayer, that we will labor to know Him better and to make Him better known! Kanabea airstrip clings to the side of Sawe Mountain (the green patch just left of center). Thank the Lord for skilled (and brave) pilots who take us in and out. PNG Tribal Foundation & GE donated a V-Scan ultrasound for Kunai Health Centre to use. Works for ante-natal moms and broken bones too! 11 years ago today, my life changed drastically. In the morning, I had a conversation with my son Ben, a junior in college, about the chance to do an internship in Washington, DC. He wanted to be a lawyer. He’d turn 20 the next day. His birthday present was wrapped, ready to be delivered when I would go to see him in a couple of days. In the afternoon, I received a call telling me that he was lost, gone, pulled out to sea in the undertow. No hope, the paramedic said. He’s gone. In the days, weeks, months, and years that have followed, my family has received such an outpouring of love and mercy and care that I still find it hard to realize how God’s people can truly care so much. We have seen lives reclaimed by Jesus, both those who never had known Him before, and those who had wandered astray. We have met servants, dear servants of God, who have yielded their lives in obedient service to the King of Kings because this trying event forced them to face their own eternity with a renewed soberness. And we have known precious saints of God, dear loving friends and amazing family, who have given themselves to being compassionate to those who hurt and to those who suffer and to those who have lost, all because they felt with us an incredible burning loss. God took a young man’s life and multiplied it. And He’s still multiplying it, eleven years later. It’s said that there’s no love like a mother’s love. I witness it every year at this time. With tears. With weeping. With strength that only comes from God and His word. With rejoicing that the grave is not the end; no, not at all. And I hold her and weep with her. And I witness our sons and their families as they lavish love on their mom, even as they feel their own pain and loss. This afternoon I could not find any yellow roses in Valley Station. Realizing how silly it would be to drive around to other places to find them, I compromised and got yellow daisies. But I was still feeling guilty. And then I saw why there are no yellow roses in Valley. I am not the only one that loves Benny. I love you, Lena. And we all love you, Benny. It won’t be long now, and we’ll all be together again. The vision is JESUS – obsessively, dangerously, undeniably Jesus. The vision is an army of young people. You see bones? I see an army. And they are FREE from materialism. They laugh at 9-5 little prisons. They could eat caviar on Monday and crusts on Tuesday. They wouldn’t even notice. They know the meaning of the Matrix, the way the west was won. They are mobile like the wind, they belong to the nations. They need no passport. People write their addresses in pencil and wonder at their strange existence. They are free yet they are slaves of the hurting and dirty and dying. The vision is holiness that hurts the eyes. It makes children laugh and adults angry. It gave up the game of minimum integrity long ago to reach for the stars. It scorns the good and strains for the best. It is dangerously pure. Light flickers from every secret motive, every private conversation. It loves people away from their suicide leaps, their Satan games. This is an army that will lay down its life for the cause. A million times a day its soldiers choose to lose that they might one day win the great ‘Well done’ of faithful sons and daughters. Their solid faith in a Sovereign God fuels motives for love, for action, for evangelism. Knowing Christ and making Him known is more than a motto; it is their heartbeat. Confident in their Faithful Father, following their Servant Savior, and indwelt by their Holy Spirit, they drive, they plunge, they plod, they pursue. Glory goes to their God. Praise and worship flow through the Spirit. And to the Lamb goes the reward of His suffering. This is the sound of the underground. The whisper of history in the making. Foundations shaking. Revolutionaries dreaming once again. Mystery is scheming in whispers. Conspiracy is breathing. This is the sound of the underground. And the army is discipl(in)ed. Young people who beat their bodies into submission. Sacrifice fuels the fire of victory in their upward eyes. Winners. Martyrs. Who can stop them? Can hormones hold them back? Can failure succeed? Can fear scare them or death kill them? And the generation prays like a dying man with groans beyond talking, with warrior cries, sulphuric tears and with great barrow loads of laughter! Waiting. Watching: 24 – 7 – 365. Whatever it takes they will give: Breaking the rules. Shaking mediocrity from its cozy little hideout. Laying down their rights and their precious little wrongs, laughing at labels, fasting essentials. The advertisers cannot mould them. Hollywood cannot hold them. Peer-pressure is powerless to shake their resolve at late night parties before the cockerel cries. Serving as Jesus’ hands and feet is not beneath them. They need no accolades; they only need opportunity. They are incredibly cool, dangerously attractive inside. On the outside? They hardly care. They wear clothes like costumes to communicate and celebrate but never to hide. Would they surrender their image or their popularity? They would lay down their very lives – swap seats with the man on death row – guilty as hell itself. A throne for an electric chair. With blood and sweat and many tears, with sleepless nights and fruitless days, they pray as if it all depends on God and live as if it all depends on them. Their DNA chooses JESUS. (He breathes out, they breathe in.) Their subconscious sings. They had a blood transfusion with Jesus. Their words make demons scream in shopping centers. Mediocre, half-baked churchianity doesn’t appeal to them. Jesus’ call to forsake all has gripped them, and it is Jesus they follow. The false, lazy armchair brand of Christianity produces false, lazy Christians–if it produces Christians at all. No thanks, they say; I’ll take Jesus. Don’t you hear them coming? Herald the weirdos! Summon the losers and the freaks. Here come the frightened and forgotten with fire in their eyes. They walk tall and trees applaud, skyscrapers bow, mountains are dwarfed by these children of another dimension. Their prayers summon the hounds of heaven and invoke the ancient dream of Eden. And this vision will be. It will come to pass; it will come easily; it will come soon. How do I know? Because this is the longing of creation itself, the groaning of the Spirit, the very dream of God. My tomorrow is his today. My distant hope is his 3D. And my feeble, whispered, faithless prayer invokes a thunderous, resounding, bone-shaking great ‘Amen!’ from countless angels, from heroes of the faith, from Christ himself. Thy kingdom come, Thy will be done, on earth, as it is in Heaven. Bring it on. Give us Thy grace, Thy wisdom, Thy power, Thy love, Thy heartbeat. And as Thy church advances, the gates of Hell shall not prevail against her. To You, our only wise God, be honor and glory and praise and victory! How can we ever fully comprehend our awesome God? In trying to grasp Him for myself, and in order to communicate Him to our people, I find I delight most when HE reveals Himself through His work and His Word. Ben is continuing his exposition of 1 John in the Kamea language, and our people enjoy the sweet sound of the Scriptures in their mother tongue. Imagine hearing about God’s love in your heart language for the first time! We are also teaching a series on the church, with a goal to more firmly establish a mature church. Presently I am teaching on symbols in the church, including the cross, baptism, and the Lord’s Supper, showing the meaning of each for us as believers. Simultaneously, I get the privilege to lead us through Ephesians, and our focus for the last two months has been on the family. Would you pray with me as we move into Ephesians chapter 6 soon, and deal with the topic of spiritual warfare? Never in my life has this topic been so intensely real as it is here and now. Pray with us that God will do a work in saving sinners and nominal believers, and that He will reveal Himself as mighty over the works of the adversary and the forces of darkness. More than just hearing simple platitudes about having victory through Christ, we want the Word of God to fill their minds and to free them from the fear of evil spirits that they live with every single day! Ben traveled with us to Calvary Baptist Church in Lae City last month. Pastor Phillip Sorulen hosted a pastors’ workshop and missions conference, and we were blessed and encouraged by the teaching and preaching. Pastors attended from many places around PNG. I enjoyed my sessions with the pastors and people, and count it a privilege to be invited to take part. Calvary Baptist Choir singing to a packed church house! At present I have completed the front translation of Acts. Ben is well past the half-way point with the Kamea translation, and Yali is close behind doing the back translation for our review. Sarah Glover is continuing with Kamea literacy, and more and more of our people are beginning to read the Word in their own language. that God would get all the glory! The PNG National Health Department surprised us with a plane load of medicine–flown up here at their expense! We minister among the Kamea people in the remote mountains of Gulf Province, Papua New Guinea. We strive to make Christ known through evangelism, church planting, medical missions, and Bible translation. We are sent by Landmark Independent Baptist Church of Louisville, Kentucky, USA, and serve with That They May Know, PNG.